Between 1974 – 1976 in Topeka Kansas when our family was young we would stop for a bag of onion rings before we spend the day at the pool. 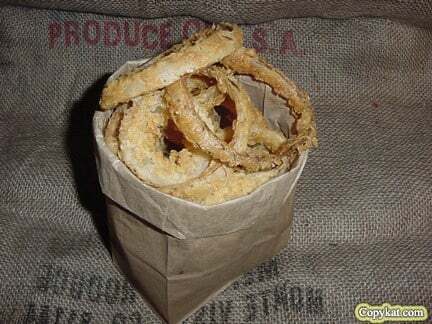 The onion rings were always served in a brown paper bag. Make the best onion rings just like Fat Ronnie did in Topeka, Kansas. Place buttermilk in one bowl and set aside. Mix flour, salt, pepper, and baking powder in separate bowl. Heat oil at 375 for frying. Dredge onion rings in flour mixture first, then dip in butter milk and then coat with flour mixture again. Place onion rings in hot oil and do not crowd onion rings. When onion rings are golden brown remove from oil and drain. More salt may be added to your taste. Could I USE GLUTEN FREE FLOUR instead ? You could use it, but I don’t think the results would be exactly the same. These were really amazing onion rings. I love onion rings especially ones coated in flour. These will be made in my house often! They were so good!! !